Someone who is abstemious avoids doing too much of something enjoyable such as eating or drinking, but rather consumes in a moderate fashion. When you are acquisitive, you are driven to pursue and own wealth and possessions, often greedily. An ascetic denies himself the pleasures of life in an extreme way, being exceedingly strict with himself. If you covet something that someone else has then you have a strong desire to have it for yourself. A deficit is when a person or government spends more than they take in in income or tax revenue. To denude an area is to remove the plants and trees that cover it, or to make something or someone bare. Desiderata are a wish list of things that are considered highly desirable or necessary to have. If you describe someone as epicurean you mean that she gets great pleasure in material and sensual things, especially good food and drink. An extravaganza is an elaborate production or spectacular display which is meant to entertain, often in an excessive fashion. Someone who is frugal spends very little money and even then only on things that are absolutely necessary. If one is indulgent one tends to let other people have what they want; one can be kind to excess when being indulgent. If someone has an insatiable desire for something she always wants more of it and never feels that she has enough. A monastic lifestyle is very simple, not given to excess in any way, but rather living in a self-denying way. An ornate object is heavily or excessively decorated with complicated shapes and patterns. A palatial structure is grand and impressive, like a palace. A parsimonious person is not willing to give or spend money. Someone who behaves in a prodigal way spends a lot of money and/or time carelessly and wastefully with no concern for the future. If you describe a person’s behavior as rapacious you disapprove of her because she always wants more money, goods, or possessions than she really needs. If you are ravenous you are extremely hungry. The austere, plain chamber in which the monk lived reflected the strict nature of his holy vows. In his bare dwelling, the monk practiced the austere and stern disciplines of prayer, fasting, and chant. When visitors came to him for help, his expression of welcome was in no way severe or austere but rather warm and welcoming to all those in need who crossed his threshold. Quiz: Try again! What does it mean when something is austere? It is solitary and sets itself apart from other things. It is devoted to religious practices and ritual. It is simple and without luxury, possibly too severe. If you describe someone as austere, you might disapprove of him because he is strict and severe. Austin Steers Wrong Way We were hoping that the austere and stern priest might steer Austin towards more serious pursuits, but Austin's fun-loving and partying way of life did not give way to the priest's somber and strict advice. Austere rules and regulations can often be “harsh, rough, or bitter” for those who have to follow them. 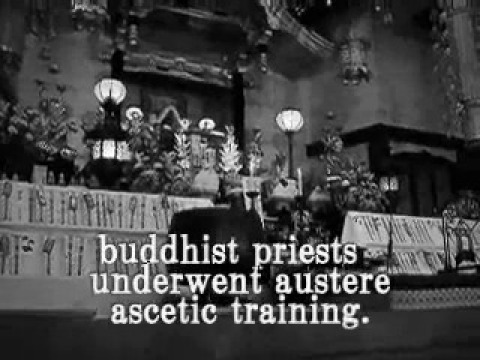 Buddhist Priests These Buddhist priests are undergoing austere training for a period of one-hundred days.